An ideal choice for the needs of medium-sized commercial endeavours, the Sharp R21AT catering microwave oven features a 28 Litre oven capacity, and can facilitate cooking times of up to 30 minutes. 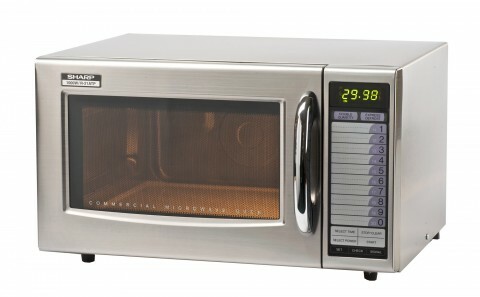 Easy to stack, and featuring a hard wearing and easy to clean solid stainless steel construction, the Sharp R21AT heavy duty microwave offers practicality and ease of use to operators. With 20 memory settings and a handy express defrost facility, this commercial microwave oven offer the versatility that modern workplaces demand. On top of everything else, a 12 month manufacturer’s on-site warranty ensures post-purchase peace of mind.